22 oz Spray. 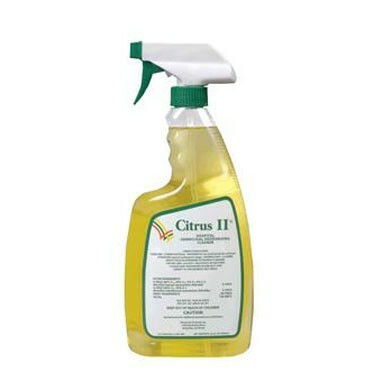 Citrus II Hospital Germicidal Deodorizing Cleaner is designed specifically as a general non-acid ready-to-use cleaner and disinfectant. Meets OSHA Bloodborne Pathogen Standard for: HIV, HBC, HCV and HAV. Safe to use non-flammable formula. Non-alcohol formula. Effective against strains of antibiotic resistant bacteria. Kills many bacteria in 3 minutes or less. Kills Tuberculosis in 5 minutes.